Larger than life portrait paintings line the walls of multiple galleries throughout the exhibition, but it is Wiley's new stained-glass "paintings" that initially greet museum visitors. At first glance, the unexpected contemporary medium demands the viewer to accept this Wiley Utopia where unorthodox black males are youthful muses who pose as Saints. In Saint Remi (2014), the surprising juxtaposition of gold halos and wheat Timberlands unsurprisingly pokes fun at the standard figures used for religious narrative on stained glass. This colorful playfulness is the anchor with which Wiley explores the deeply complicated racial assumptions in a "Post-Trayvon" era. The black American males, who are depicted as various saints and historical figures, are not models. Oftentimes they are strangers that the artist approached on the street. Once the subject agrees to model, Wiley asks them to choose a reproduction of a painting in order to reenact their pose. This process of "street casting" emphasizes Wiley's intention to collaborate with his everyday subjects and provide a sense of power for each individual in his monumental paintings. Innocence is personified in so many of the various African Americans on view. Working within the conventions of traditional European portraiture, Wiley paints meticulously detailed facial features on the picture plane. Observing more than sixty works by Wiley creates a dizzying effect. 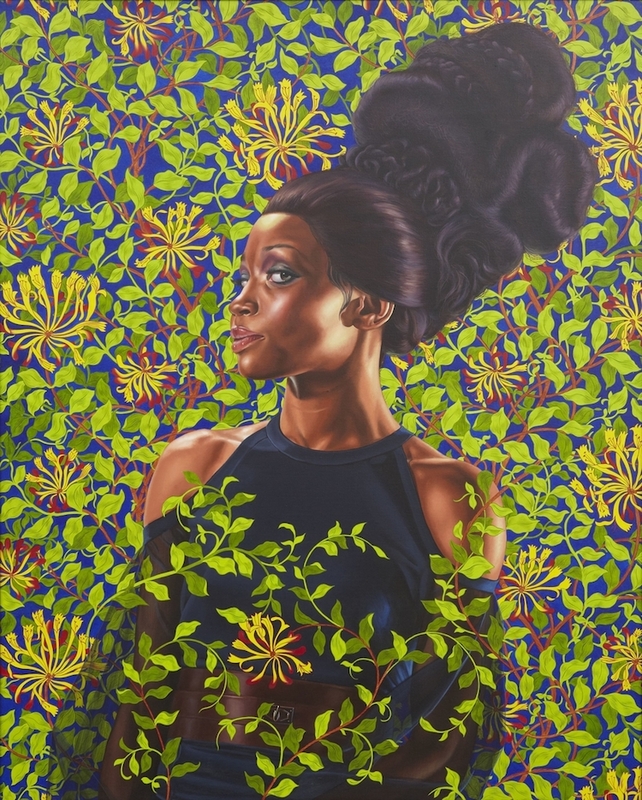 The bold color palette and vividly patterned background could swallow up the figures in the foreground, but Wiley's talent is seen in the way the character's expression remains in focus. Such beautiful boys are depicted in each painting. Hues of caramel and molasses and honey mix and mold smooth faces and innocent gazes. Even the older subjects have a palpable boyishness. There is a sense Sprezzatura, or studied carelessness, in the men's eyes: Wiley leaves no doubt for the viewer that the beauty of these black men will be recognized despite the chaos surrounding them. Interestingly enough, Wiley's paintings of strong, robust women in his series, An Economy of Grace; highlight the contrast between the somewhat harshness of his female figures and the softness of his male subjects, especially seen in Mugshot Study (2006). 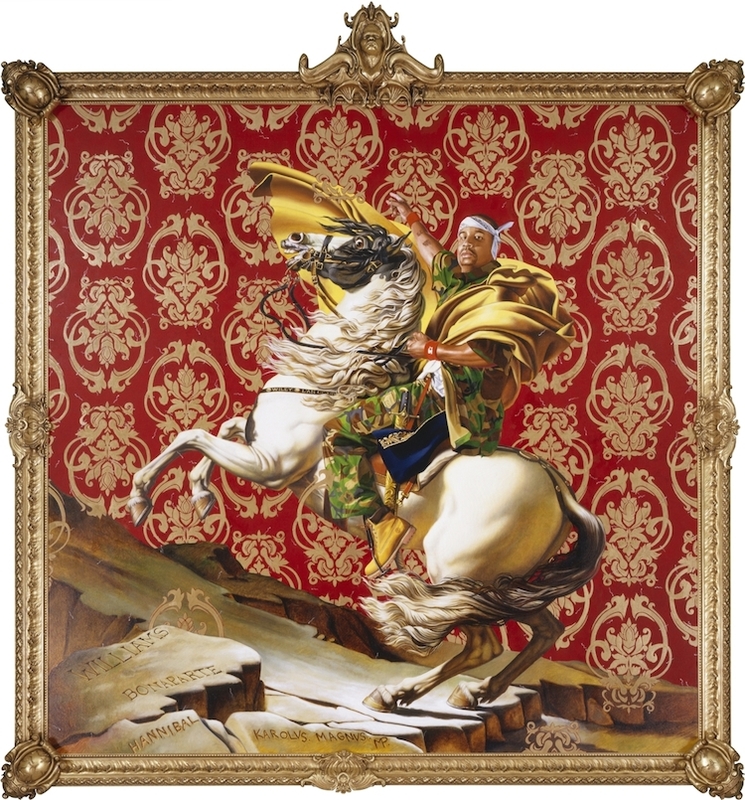 Without a self-titled self-portrait in sight, the exhibition suggests a parallel between Wiley's practice and his future: while Wiley focuses on inserting African Americans into the past cannon of art history, the artist will be remembered in the future for inserting himself into the conversation of the present. Even though Black History Month has ended, Wiley's constant inclusion in the press is in good company with theater productions like Disgraced on Broadway and Hamilton at The Public that force audiences to challenge stereotypes of race and power. Perhaps Wiley does not have to wait for the New Republic much longer. Perhaps the future is here in his paintings, and to be sure, his future is in each of his viewers who await his next move.